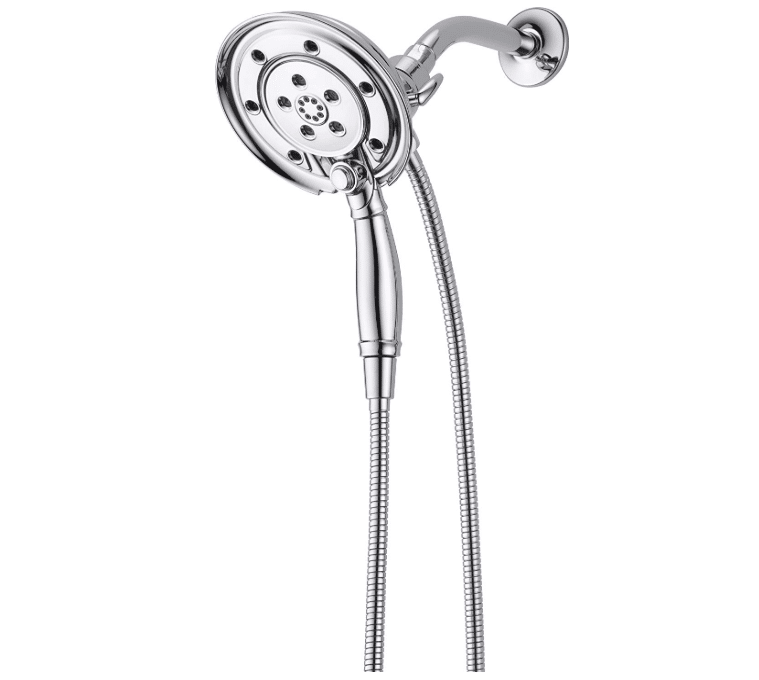 Today, we are going to dive into reviewing the Delta In2ition 58471-PK hand shower head. This one caught my eye because of its sheer beauty. Very shiny chrome coating makes it stand out with any kind of background. I mean look at it, it looks very high quality, and to find out whether it is or not... you'll need to stick around and read further. Just as disclaimer, it is priced at a premium compared to others (especially if you choose one of the other colors it comes in). However, its cost may be excusable if you see what kind of cool things you can do with it. Look at it and tell me it doesn't look like a "single" shower head. You'd be right to an extent, however that's where things get a bit different. Most are with traditional design of having separate fixed one, and one separate mobile one. Where this Delta unit makes it different, is how the integrate two into one. The handheld wand is in center and its outer parts which make up a "halo" look, is the second shower head. Water comes out from 6 big jets that are in the "halo" part, and 5 more jets come from the handheld part. That's not even talking about the 8 smaller ones found in the center of the handheld part. We are going to get into important details of it all below, so keep reading! This has to be my favorite part, going into the unique features associated with a product. Here we are going to discuss the Delta In2ition 58471-PK's main features. 5 Different Colors to Choose From: In many cases, one color does not suit all. With this Delta Faucet In2ition shower head, you get a total of 5 colors to choose from. The following are: Chrome, Champagne Brown, Polished Nickel, Stainless, Venetian Bronze. Each color looks drastically different, giving ones bathroom a completely different feel when installed. Do keep in mind that with the change in color comes price change, I'll cover that further below. H2OKinetic PowerDrench Spray Technology: This technology is unique to the brand Delta. From all the water outputs, you get multiple spray settings. Most regular shower heads simply spray water into one direction and in one frequency. The difference with this technology is it allows the water to pulse in different water pressures and speeds, giving a completely different feel when it actually hits your skin. The best way to describe it is, it mimics an aqua massage. Magnetic Docking: This has to be the easiest way to mount and unmount the portable wand. Typically what you'd do is mount the handheld wand into a holder (slide it into place). However here, you simply place it inside a space where it belongs and it stays there... that's it. It's called a magnetic docking, and this unit does it quite well. A feature I wish others had for sure! 3 Spray Settings: Referencing to the H2Okinetic technology these shower heads offer, select from 3 powerful spray options. Select, PowerDrench Spray, Massaging Spray, H20kinetic PowerDrench Spray with Massage, and Pause. Alright so the variety isn't vast, but in many cases too many options can cause a headache. They did it right with this one! Let's move onto advantages of this kit. I wont be wasting your time with insignificant ones, you'll see exactly what I think are most beneficial aspects of owning and using the Delta In2ition 58471-PK. H20kinetic Technology is Therapeutic: As I mentioned above the 3 major options when it comes to spray patterns, it has been reported to be very soothing and in some ways therapeutic. This has to be one of the biggest advantages of using this particular model, because most others as you already know... are nothing more than one speed settings. H20kinetic Technology is Therapeutic: As I mentioned above the 3 major options when it comes to spray patterns, it has been reported to be very soothing and in some ways therapeutic. This has to be one of the biggest advantages of using this particular model, because most others as you already know... are nothing more than one speed settings. Detachable Handheld Portion is Very Useful: Magnets have made this world to what it is today, and in instance of this kit, it's no exception. Because of its well engineered design, you can easily take the handheld portion in and out, with minimal effort. Most don't have this option, but I'm super glad this one does because it signals to some the word "simplicity". Unique and Eye Popping Colors: This may not be important to most but to some (such as myself), you'll find this a nice surprise that you can actually get a kit that matches the color of your bathroom. Say for instance you bathroom is quite dark (navy blue for instance), you can pick their Venetian Bronze, fitting right in. Vise-versa when you have a very light theme, you can pick something like the Chrome color or Polished Nickel as a shiny and eye popping color. By no means is this unit a perfect one, in fact I found a few negatives that I'd like to discuss with you about. Price is More with Different Colors: A lot of things can be said about this unit that are good, but price is not one of them. As I looked at it, it was listed for just under 140 dollars for the chrome color. I went ahead and chose a different color and started to see its price almost double in some cases, no real reason why. To be that's a big minus. Plastic... Could Prove A Problem Long Term: For the price, you would expect to get more metal parts, but unfortunately not here. Almost all parts of this shower heads are made of 100% plastic, and the button which you press to go between different settings, is also made of plastic. There are instances when this shower heads started to not go into the selected spray mode, due to the plastic gears wearing down inside. Low Water Pressure: While this patented technology is quite nice to get wide spray patterns, it fails miserably when it comes to water pressure. Assuming your water pressure is good before you install this one, you can expect it to go down a bit when this unit is installed. This may or may not be an issue for you, depends on your personal requirements. Are you looking to compare different units before you buy? If so, I have a complete guide here that reviews different wands like this one. Do have a look and let me know what your thoughts are. Lastly, if you enjoyed reading this review... consider SHARING it below to any of the below social media accounts you may have, it will be a big help!